The king bolete, also called the king boletus, is a large, charismatic wild mushroom with a distinct appearance and incredible flavor. This species is known around the northern hemisphere by many names, including porcini, steinpilz, cep, penny bun, and simply "the king." Its flavor is particularly delicious - rich, earthy, nutty, and complex. "If any mushroom deserves the dubious title of 'king,' this is the one. It is a consummate creation, the peerless epitome of earthbound substance, a bald bulbous pillar of thick white flesh - the one aristocrat the peasantry can eat!" There are certain key features that distinguish the king bolete from other mushrooms. 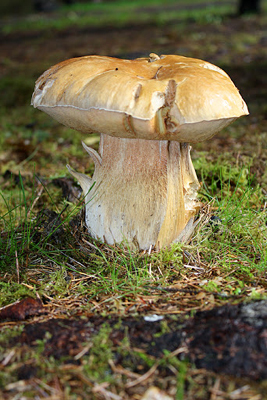 First, it belongs to the group known as the boletes or Boletus, in the family Boletaceae. These mushrooms are known for the sponge-like layer of tubes on the underside of the cap instead of gills. Second, the king grows quite thick all around and the Italian name "porcini" (meaning little pig) is very appropriate to describe this lovely mushroom. The top of the cap is generally some shade of brown. In some populations, such as many in the Cascade Mountains of Washington and Oregon, it appears golden tan, not unlike a perfectly baked bun. While in other populations, especially in the Rocky Mountains, this mushrooms cap often appears much redder in color. The tubes on the underside of the cap start our whitish initially, but are usually pale yellow to olive-yellow with age. The stalk is usually thicker at the base in younger specimens, becoming more of an even diameter with age. The stalk is white to tan in color, with fine chain-like patterns of raised lines (reticulations) especially near the upper half of the stalk. 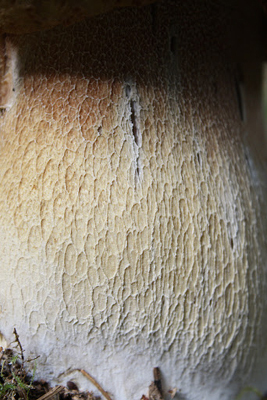 When cut, the flesh is generally white all around, but occasionally has some yellow stains near the base of the stalk. The smell of the fresh, raw mushroom is pleasant and the flavor is mild. This species appears to favor woodlands and forests throughout the northern hemisphere. It is most commonly found under conifer trees such as fir, spruce, pine and hemlock. In some places it also associates with certain deciduous trees such as birches and oaks. It is a mycorrhizal species, meaning it has a mutually beneficial relationship with the roots of those trees. You may find this species growing alone or in small groups. This species generally fruits between August and October. In coastal areas it fruits in the fall. While in the higher inland mountains it usually fruits in the late summer. This species should be cut as close to the ground as possible, rather than just pulled out of the ground. Then it can be brushed gently with a soft bristle brush and any bad portions can be cut off. Carry them out of the field in mesh or paper bags. Avoid using plastic bags, as that speeds up spoiling. They can be cooking and eaten after being sliced. Cooking them lightly in a light oil is best to preserve their flavor. If you want to concentrate the flavor, or if you just want to preserve them, then slice them and dehydrate them until crispy dry. They can keep for months to years, especially when kept in sealed glass jars. To learn more about the king bolete and other delicious wild edible mushrooms, check out our Mushroom Classes. You can read more information on the Wikipedia King Bolete page. 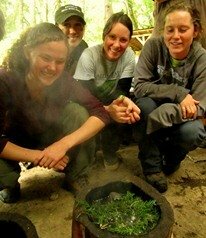 Mushroom foraging is also taught as part of the Alderleaf Wilderness Certification Program.